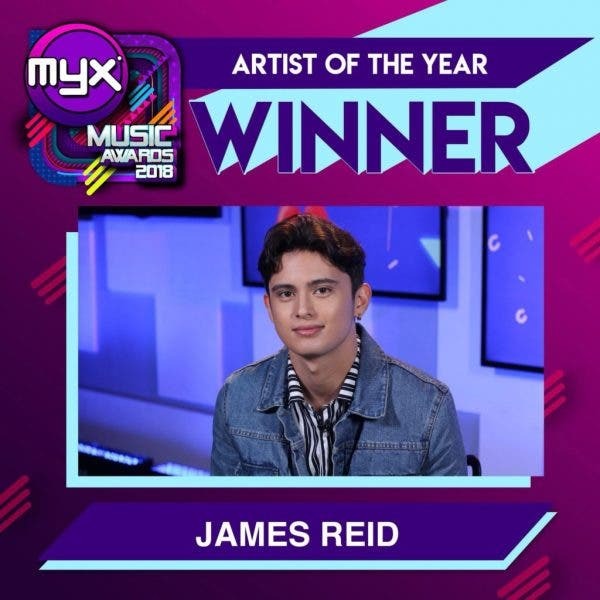 James Reid ruled over the competition with big wins—Song of the Year, Male Artist of the Year, Artist of the Year, and Music Video of the Year-at the 13th MYX Music Awards, held last Tuesday night at the Araneta Coliseum. The heartthrob bagged five awards out of his five nominations including Music Video Guest Appearance of the Year for “The Life” featuring girlfriend Nadine Lustre. His MYX chart-topper “Cool Down” won Song of the Year while “The Life”, co-directed by Nadine and Petersen Vargas, was hailed as the winning music video. Sarah Geronimo, KZ Tandingan, and IV of Spades also emerged victorious as they took home two awards each. Sarah won Female Artist of the Year and Collaboration of the Year with Yeng Constantino for “Kaibigan Mo.” KZ, meanwhile, got Urban Video of the Year for “Labo” and Media Soundtrack of the Year for “Two Less Lonely People in the World.” New Artist of the Year IV of Spades likewise received the MYX Bandarito Performance of the Year. Also bagging trophies were Moira dela Torre, Darren Espanto, BoybandPH, Brisom, Super Junior, and Edward Barber. The grand musical event also recognized Martin Nievera as the prestigious MYX Magna awardee. Angeline Quinto, Christian Bautista, Erik Santos, Jake Zyrus, Jed Madela, Karylle, Kyla, KZ Tandingan, Morissette, Robin Nievera, and Yael Yuzon gave a powerful performance as tribute to the OPM icon. Aside from recognitions given to the artists, the biggest MYX Music Awards to date also treated fans with exciting performances of British teen sensation HRVY, IV of Spades, Shanti Dope, Gloc-9, Yeng, Julie Anne San Jose, Darren, Ylona Garcia, Elmo Magalona, Janella Salvador, Kiana Valenciano, John Roa, TJ Monterde, Klarisse, Marlisa, Jona, Jay R, REQ, Midnasty, and more. The awards night kicked off with the first-ever MYX Squadfest, a concert that showcased performances by some of the hottest young artists such as BoybandPH, Claudia Barretto, Edward Barber, Ex Battalion, Hashtags, Janina Vela, Jayda, Kisses Delavin, Maymay Entrata, Tony Labrusca, AC Bonifacio, Kyle Echarri, Jeremy Glinoga, Isabela Vinzon, Tala, Fern, and Volts Vallejo. Aside from being hosted by the current MYX Squad—VJs Ai dela Cruz, Donny Pangilinan, Inigo Pascual, Robi Domingo, Sharlene San Pedro, and Sunny Kim—the event also welcomed back iconic VJs of the past: Bianca Roque, Chino Lui Pio, Heart Evangelista, Iya Villania, Luis Manzano, and Nikki Gil. The much-awaited musical gathering also gained online buzz. The event, with the hashtag #MYXMusicAwards2018, trended at no.1 on Twitter Philippines. It included an exciting innovation with the customized MYX Twitter emoji. MYX also partnered with leading music streaming site Spotify for the first ever Spotify-made playlist for the nominees and winners.